But realizing this potential, say WorldFish and partner researchers in a response article in Nature Ecology and Evolution, will require a careful look at the species being farmed and the development of sustainable fish feeds. The world needs to produce more food to nourish its rapidly growing population, which is expected to reach 9.7 billion in 2050. And rising consumption of fish, which is expected to increase to over 20 kg per capita in the near future, means fish production will need to grow by over 20 million metric tons by 2030. But the land and water resources available to grow more food on land is becoming scarce explains Patrik Henriksson, a co-author of the response article and WorldFish consultant. “Today, agriculture takes up approximately 40 percent of the earth’s land surface and accounts for 70 percent of global freshwater consumption,” he says. In addition, land-based production of meat and dairy is a major driver of global environmental change. In the search for more sustainable ways to produce nutritious food, aquaculture holds huge potential says Henriksson. “And sustainable aquaculture practices offer water, energy and feed conversion efficiencies superior to livestock production. As a result, the overall aquaculture industry produces fewer greenhouse gas emissions,” Henriksson says. Despite this, new and more sustainable ways to farm fish are still possible and needed. And expanding mariculture—the farming of finfish and bivalves such as mussels and oysters in the ocean—is one promising option. “Fish is the only animal-source food that can be produced in saltwater, which accounts for 97 percent of the earth’s water,” Henriksson notes. Today, most mariculture occurs in coastal waters of less than 200 meters depth, due to practical challenges such as anchoring, storms, feeding and accessibility. But vast portions of these waters remain unused. “Appropriation of only a small amount of this available ocean space with suitable environmental conditions could greatly boost aquaculture production,” explains Henriksson. Doing so, however, would most likely benefit large-scale producers, who currently manage the majority of offshore mariculture operations around the globe. 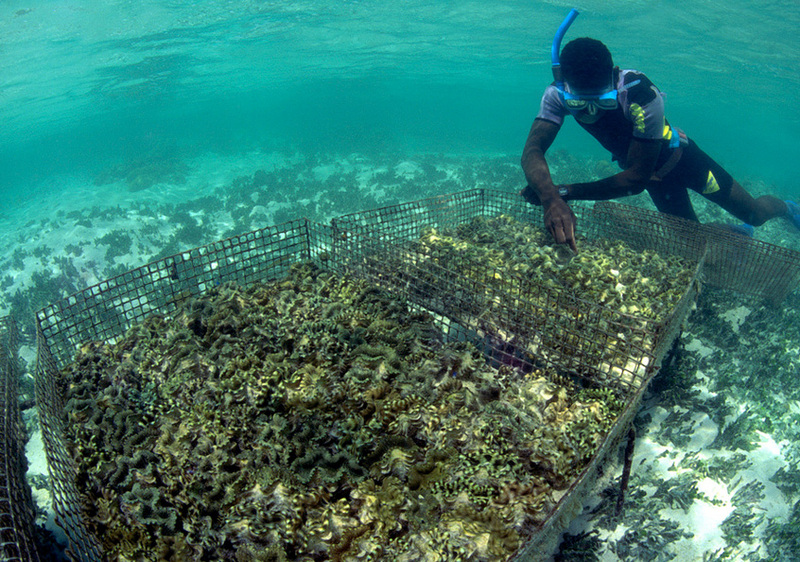 Mariculture is often capital intensive and more at risk to non-biological factors such wind and rain, making it inaccessible to many poor small-scale fish farmers. “Resources and innovations to expand mariculture should therefore focus on involving small-scale farmers to ensure they also benefit from the sector’s growth,” Henriksson says. Giant clam cage basic husbandry, Solomon Islands. To ensure the industry expands in a sustainable way will require a careful look at the choice of species being farmed and the resources—both from the land and oceans—used to feed them. Extractive species such as mussels and oysters, which make up 20 percent of global seafood production, feed on naturally-occurring plankton and organic matter. In comparison, marine finfish species such as salmon, which account for 8 percent of seafood production, are fed with commercial feeds. 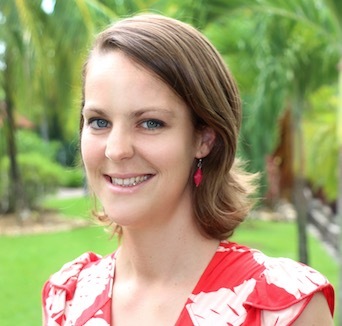 “If large-scale farming of extractive species in the oceans was increased, this would reduce pressure on feed resources and lead to the net addition of protein to the global food system,” explains Henriksson. As for the offshore farming of marine finfish, the biggest barrier to expansion is the availability and cost of sustainable feeds. “Species such as salmon, groupers, barramundi and cobia all need high-quality protein feeds, which are often based on wild fish resources and, increasingly, agricultural crops such as soy,” Henriksson says. With 89 percent of world fish stocks either overfished or fully fished, innovative feed ingredients that rely less on wild fish stocks will be critical to enabling the expansion of mariculture. 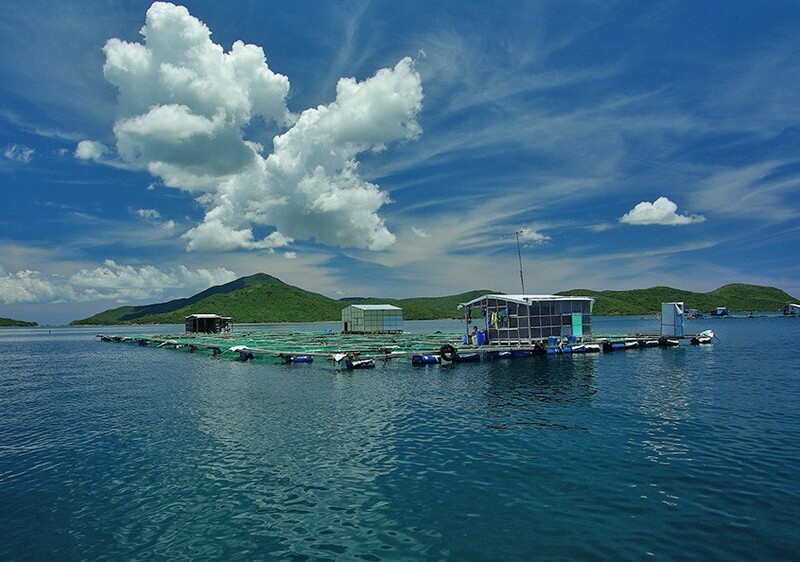 Currently, research into sustainable feed solutions for land-based aquaculture is a key focus for WorldFish, the findings of which can help inform feeding practices for mariculture. Alongside improved feeds, research into how large-scale ocean farming systems interact with ecosystems and human well-being is needed to inform national and regional governance efforts and policies, which can limit or enhance aquaculture’s growth potential. “Space is only one factor for the expansion of mariculture, but many other challenges need to be considered for the long-term success of this food sector, including ecosystem interactions and climate change,” Henriksson explains. These efforts are important early steps in realizing the vast potential of mariculture to produce more fish for a growing population without overburdening land-based resources.